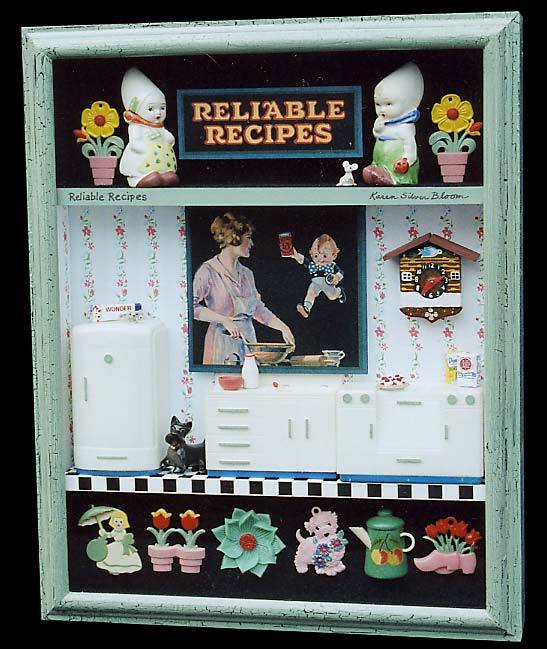 Karen Silver Bloom - "Reliable Recipes"
If you have a jadeite colored kitchen, this is the box for you! A salt and pepper shaker, curtain tie-backs and shade pulls border this 50's style kitchen. A Reliable Recipes cookbook cover, Wonder bread, checkerboard floor and scottie dog add to the period feel. The frame is finished with a black and sage green crackle, and the back of the box is covered with a vintage barkcloth kitchen fabric to match.